What do air curtains do? They protects against expensive heating and air conditioning from escaping the building. Used for maintaining comfort levels for staff/customers. Safeguarding a clear access in/out of the property. Air curtains (commonly referred to as air doors) are designed to help stop unwanted air and its contaminants from entering a restricted area of a building. This can range from an office block that has a doors that are constantly opening or closing to a shop with an open front entrance. HSDoors high quality air curtains are created to maintain a constant air quality and help prevent your space from becoming breached by unwanted contaminants. We install and maintain air curtains all across Kent, Essex, Sussex, London and the South East to a host of clients. Air curtains work by separating two differing areas of temperature with a curtain of air. They generate a fast moving air stream to block the movement of air through the door whilst still allowing the door to stay open. The goal is to place one above or to the side of the entrance covering the width of the door stopping heated air escaping in winter or cooled air escaping during the summer. The positioning of the air curtain is pivotal, being too far from the entrance will decrease the performance, with air leaking around the generated stream. Extractor units are commonly used within the building, a ventilation system should also be installed to equalise pressure differences for the maximum overall effectiveness. 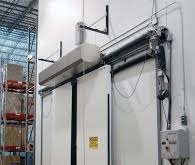 Whilst retaining the cooled air within a cold storage room, an air curtain significantly reduces the amount wasted energy, whilst retaining its full access. Having no doors/curtains reducing user visibility, safety is drastically improved whilst moving around the property.